Jones was born in Jackson, Tennessee. He attended Jackson Central Merry High School where he played baseball and basketball. He only played three football games, because his high school did not support the sport until his senior year. His basketball skills earned him All-America honors and scholarship offers from several Division I (NCAA) programs. He also had offers from Major League Baseball teams to play first base in their farm systems. As a senior, he fought a Golden Gloves boxing match, recording a knockout of his opponent in less than a minute. He stopped shortly after that, when his basketball coach read an article about the fight, and made him choose between basketball and boxing. The 6 ft 9 in (2.06 m) Jones received his famous nickname during his first football practice, after a teammate mentioned that his pants didn't fit, because he was “too tall to play football". In his new sport, he became a two-time All-American defensive lineman, playing on a team that only lost 2 games, en route to winning the black college football national championship in 1971 and 1973. Jones ranks third in school history in sacks in a season (12) and fifth in career sacks (38). In 1999, he was voted to the 50th Anniversary Senior Bowl All-Time Team. 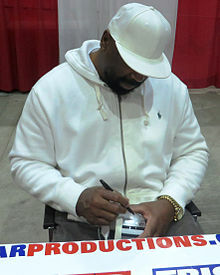 A former Golden Gloves fighter in Tennessee, Jones would fight six professional bouts as a heavyweight, with a perfect 6–0 record and five knockouts. Due to his high profile as a football player, all of Jones' fights were televised nationally, by CBS. His pro boxing debut, held in Las Cruces, New Mexico, on November 3, 1979, was controversial. Despite giving away over fifty pounds, opponent Abraham Yaqui Meneses dropped Jones with a left hook in the sixth and final round, then hit him again (illegally) when Jones was down. Jones' cornerman then entered the ring (also illegally) and attempted to revive his fighter with an ammonia bottle. Referee Buddy Basilico reasoned that since both fighters had broken the rules, he would punish neither of them, and let the fight go on. Jones survived the round and was awarded a narrow majority decision, causing the pro-Meneses crowd to boo loudly. The Meneses bout was the only one of Jones' fights he would not win by knockout. But his other five opponents were journeymen at best, with the arguable exception of Mexican heavyweight champ Fernando Montes, whom Jones knocked out in just 44 seconds on November 24, 1979. After his last ring appearance on January 26, 1980, Jones announced he would return to play for the Dallas Cowboys. In a 2016 interview, Jones called boxing his favorite sport and said that fighting "was probably the best decision [he] ever made," because his boxing training regimen made him a better football player. 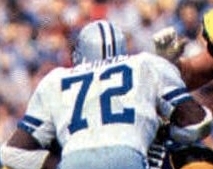 Jones playing with the Cowboys during the 1985 season. Jones earned All-Pro and Pro Bowl honors three times from 1981 to 1983. He retired at the end of the 1989 season, having never missed a game, playing the most games by any Cowboys player (232) and being tied with Mark Tuinei and Bill Bates for most seasons (15). The NFL didn't start recognizing quarterback sacks as an official stat until 1982; although the Cowboys have their own records, dating back before the 1982 season. According to the Cowboys' stats, Jones is unofficially credited with a total of 106 quarterback sacks (third most in team history) and officially with 57.5. He is the fifth leading tackler in franchise history with 1,032. In 1985, he achieved a career high of 13 sacks. ^ a b NFL.com, "Too Tall Jones, DE". Nfl.com (2012-12-31). Retrieved on 2013-07-13. ^ EdTooTallJones.com, "Ed 'Too Tall' Jones, Bio" Archived 2012-01-12 at the Wayback Machine. Edtootalljones.com. Retrieved on 2013-07-13. ^ Ed (Too Tall) Jones is a great athlete who has never lived – 05.04.81 – SI Vault. Sportsillustrated.cnn.com (1981-05-04). Retrieved on 2013-07-13. ^ "Ed (Too Tall) Jones vs. Abraham Yaqui Meneses". boxrec.com. ^ "Ed "Too Tall" Jones: Boxing Was 'Best Decision'". NESN. February 5, 2016 – via YouTube. ^ Geico 'Too Tall' Jones on YouTube. Retrieved on 2013-07-13.